"The B&OCT bridge, like the terminal and the tracks, has been abandoned. However, it was not dismantled and remains permanently locked in an "open" position. Because they are bascule bridges, both the B&OCT and the Air Line bridges each have a counterweight of their own, and in this case, they share a common third counterweight between them. This design allowed them to operate in unison, with an operator from the B&OCT in charge of operating both bridges. This has led to a curious historical oddity, as the CSX, successor railroad to the B&O, owns a useless bridge that it cannot abandon, because the bridge is needed to continue operating a second bridge it does not own. 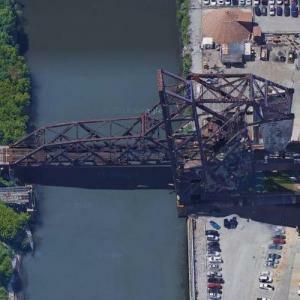 An uncertain but inevitable future awaits the old B&OCT bridge, as the trackage it once served will likely never be rebuilt."